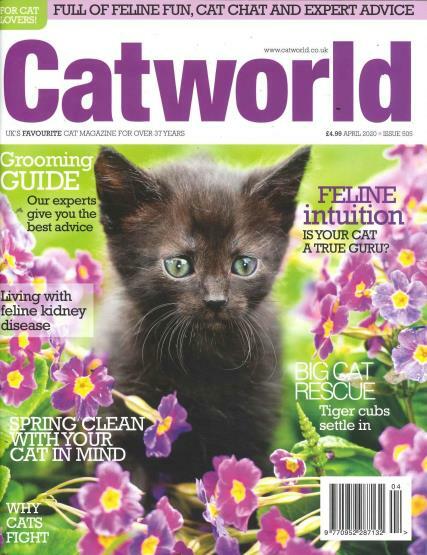 Cat World is a monthly magazine providing information for thousands of cat lovers.Buy a single copy or subscription to Cat World magazine. Cats have been domestic animals since ages and they are among the best companions a man can ever have. Cats are present in all parts of the world. The magazine has been coming out for over twenty years and it now has a Facebook page, Twitter ID and a website. Thousands of cat lovers benefit from the information contained in the magazine each month. Having a cat is easy but caring for it is difficult. Cat World magazine contains in depth information about habits of cats, how to care for them and how to keep the cat healthy. It also discusses about breeding, making it easy for the user as he can find everything under one umbrella. The magazine mostly presents articles that are fun and light hearted to read. It lets the user learn more about cats while staying entertained at the same time. It even publishes articles that help you name your new cats. It also covers various diseases that can plague cats and how to prevent them. Results and photos from local and important national cat shows are posted in the Cat World magazine. There is also a separate section called “Paw Post” that publishes readers’ letters and pictures of their cats. Also the featured cat of each issue is of a different breed and country to give you enough variety.